Searching for a Wisconsin Vacation Rental? We believe your family vacation should start with the online Search. We’ve made it fun and easy. You’re on cabin time now! 1. 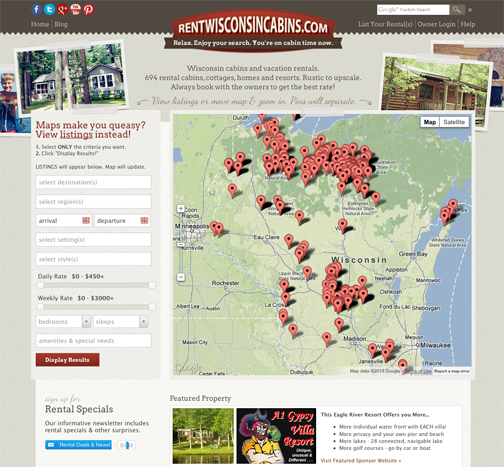 One website that is entirely focused on Wisconsin cabins, cottages, lodges and homes. 2. A website that offers a large selection. 3. A website where you can CONNECT and BOOK directly with the owners. These days, it’s hard to find. Have you noticed that most vacation rental websites now make your book through their site? Third-party websites take a commission on every booking. That means you’d likely pay more for the same rental because rental owners raise their rates. Not at RentWisconsinCabins.com: You always book directly with the owners and Save – Besides, the owners are your best tour guides, not booking websites. 4. Finally, you need a website that offers easy Search Tools that narrow your search. When it’s vacation time, it’s time to visit RentWisconsinCabins.com. This entry was posted in Wisconsin Vacation Rentals and tagged cabins, cottages, lakefront resorts, lodging, rentals, vacation, wisconsin. Bookmark the permalink. ← When it comes to planning a #vacation, women rule!